What’s not to love about a party – the food, the fun… and throw in a friendly turtle, a baby shark, some striking sea stars, and you’ve got the makings of a pretty memorable day for any young nature lovers! Ocean Life Education loves a good celebration – especially when we get to share our passion for all things sea related with a roomful of eager attendees. So when the call came to be part of a young shark lover’s birthday, we didn’t need to be asked twice! Now its fair to say that sharks are not a regular sight at Kawana Aquatic Centre on the Sunshine Coast – and we hasten to add ours was not let loose in the pool but Bob was there none-the-less along with some colourful companions. The constant rain was forgotten as birthday boy Nixon and his friends became fascinated by our menagerie of marine animals – gentle touching them to help create connection and understanding which will hopefully lead to a lifelong desire to protect them and help conserve their environment. 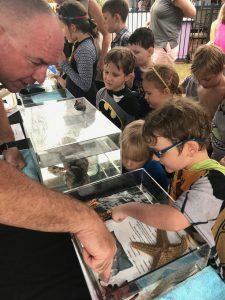 Our Ocean Life animal ambassadors are guests of honour at all sorts of parties – from Kindy break-ups, to Xmas celebrations and any community events celebrating nature. And while we like to think we’re educating through fun interactions, sometimes it’s the party recipient themselves who teaches us all a lesson in caring. Young Mia was so determined to make a difference to ocean animals, she encouraged all her friends to make a donation to the Australian Marine Conservation Society – instead of bringing gifts. She raised $200 to help fund efforts to preserve our oceans for generations to come. It’s children like Mia and Nixon that makes it all worthwhile for us and even more reason we love to hang with our party animals. This entry was posted in Uncategorized on November 24, 2017 by oceanlifeeducation.